For many Native Americans of the Northern Plains, Thanksgiving is just another day. According to the U.S. Census Bureau, the 2014 poverty rate for children under the age of 18 was 21 percent. Compare that to the 35 percent of Native American children living in poverty and the difference is staggering. Additionally, 90,000 Native Americans are homeless and 40 percent of Native Americans live in sub-standard, overcrowded housing. The NPRA Thanksgiving service provides food to Program Partners that wish to bring communities together. 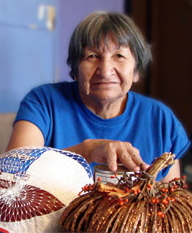 NPRA Thanksgiving also helps a limited number of Native American Elders enjoy a nutritious and uplifting holiday meal at home with their families. Much more than a holiday meal, our reservation partners recruit volunteers to cook, set up, clean, and serve during the meals. Local volunteers have the opportunity to feel productive, serve their communities, and meet other caring individuals. We have seen time and again how these connections can spark needed change in communities. Partners are seen as a resource beyond their typical services they offer and this connects them to Elders on a different level. The perishables arrive in refrigerated trucks, and the volunteers work quickly to unload the skids and store the food for cooking. Elders receiving individual family meals pick them up or they are home-delivered by our reservation partner.